Several UFO incidents, including multiple-witness sightings by military personnel and ground traces with above normal radioactive readings, were reported in late December 1980 at the Rendlesham Forest in Suffolk, England. The site was near two then-important NATO bases leased to the U.S. Air Force: RAF Bentwaters and RAF Woodbridge. "A bank of lights, differently colored lights that threw off an image of like-a-craft. I never saw anything metallic or anything hard." 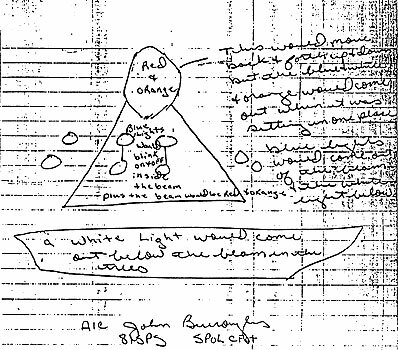 Sketch with notes by USAF law enforcement patrolman John Burroughs of the UFO he encountered at the Rendlesham Forest after Christmas 1980. Courtesy of Antonio Huneeus. "I was very skeptical. I found what allegedly had taken place hard to believe, and I was really going to debunk it quite frankly; and as events unfolded I became more and more concerned that there maybe is something to this... I kept telling myself that there had to be some type of explanation for it, but I certainly couldn't find one and even to this day I can't explain what happened." "Our worried skeptical colleagues have already had to advance an extraordinary hotch-potch of explanations: space debris, a bright meteor, a police car, drink and drugs, a lighthouse, other lights on the coast, dear old Sirius. 94. Halt, Lt. Col. Charles I., USAF, Memorandum to MOD, "SUBJECT: Unexplained Lights," January 13,1980. 95. Huneeus, Antonio, "The Testimony of John Burroughs," Fate, September 1993. 97. Halt, C. I., ibid. 98. Transcript of Col. Halt's audio recording published in Good, T., Above Top Secret, Quill, William Morrow, 1988. 99. Halt, C. I., ibid. 100. Interview with Col. (Ret.) Halt, Unsolved Mysteries, "U.S. military officers discuss a 1980 sighting of an unidentified flying craft near a U.S. air base in England," originally broadcast on NBC-TV on September 18, 1991. 101. See Butler, Street & Randles, Sky Crash, Neville Spearman, 1984; Randles, J., From Out of the Blue, Global Communications, 1991; "The Bentwaters Incident," articles by Jenny Randles, Ray Boeche and Antonio Huneeus, Fate, September 1993. 102. Pope, Nick, lecture at the New Hampshire MUFON Conference, Portsmouth, September 10, 1995. 103. Noyes, Ralph, "UFO lands in Suffolk - and that's Official," chapter in Timothy Good's anthology, The UFO Report 1990, Sidgewick & Jackson, 1989.